Dr Sue Pillans has always been drawn to the ocean with many fond memories of growing up in regional Queensland, Australia, where visiting the beach and being outdoors with nature was part of life. Sue has been drawing and telling stories since she was young and grew up to become a marine scientist, artist and author who still loves sharing her stories through words and pictures. She combines her love of art and science to specialise in creative and visual communications to help picture your ideas. Sue’s deep devotion for the ocean is also shared through her alter ego, Dr Suzie Starfish, who uses the art of marine science and storytelling to engage children and the community with the wonders of our living oceans. Her unique storytelling approach helps to make learning visual, creative and fun for children. 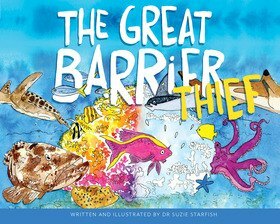 As an author/illustrator Dr Suzie Starfish uses illustration and information to inspire the imagination to bring her sea stories to life. You can follow Dr Sue’s visual storytelling and creative journey via her website at http://www.drsuepillans.com @suepillans on Twitter and Instagram and dive in with Dr Suzie Starfish on Facebook.